Fig. 10-8. Design variations in passive wedging chocks: a, wide side, straight sides; b, narrow side, straight sides; c, wide side, curved sides; d, narrow side, curved sides; e, top view, rectangular; f, top view, trapezoidal. Fig. 10-7. Wide-side and narrow-side placement of passive wedging chocks: a, wide sides are in contact with the rock, a stronger placement; b, narrow sides are in contact with the rock, a weaker placement. have slightly curved sides. They can also have a combination of straight and curved sides. Smaller wedging chocks are usually straight-sided, while larger chocks may have pronounced curvature. Viewed from the top, wedging chocks can be rectangular or trapezoidal. The goal in using any wedging chock, regardless of shape, is to create a stable and secure point of protection—something you can stake your life on. A straight-sided chock may not place well in a crack with an uneven surface, whereas a curved chock may fit nicely. In another spot, the straight-sided chock could be just the thing. A curved-sided chock creates three points of contact, which adds to stability (fig. 10-9). However, it may seat so securely that it can be tough to remove. If the edges on a wedging chock are slightly rounded, it tends to be easier to remove. The Hexentric passive camming chock can also be used as a passive wedge. Even though it doesn't look like a wedge, the ends of the Hexentric are tapered, allowing it to wedge in a constricting crack (fig. 10-10). 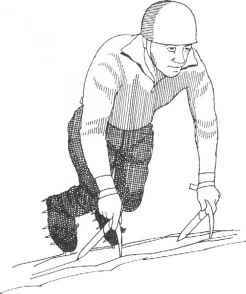 In an emergency, the knot of a runner can be jammed into a constricting crack and serve as a wedging chock. Here's where wedging chocks work the best. Put the chock above a constriction in a vertical crack. A downward pull wedges the chock more tightly into the crack. straight-sided chock works well. If the sides are rougher or slightly curved, a curved-sided chock works better. For the most secure placement, slot the wedge completely into the crack (fig. 10-11). Passive wedging chocks usually are able to hold a load only in one direction. However, if the chock is slotted deeply into a crack and seated correctly, it can handle pulls from multiple directions. Fig. 10-11. 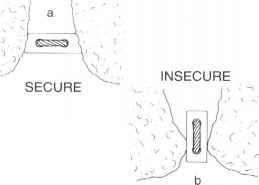 Passive wedge slotted in a vertical crack: a, secure, slotted completely into a vertical crack; h, insecure, slotted partially into a vertical crack. Passive wedging chocks do not work in parallel-sided vertical cracks (fig. 10-12). If the sides of the crack are straight and parallel, the chock has very little contact with the rock, and a severe downward pull can cause the contact points on the chock to shear. Fig. 10-13. Stacking chocks: a, two independent chocks stacked together; b, chock stack. There's a way around this problem: use two wedges in a method called stacking. Stacked chocks can be created from two independent chocks or from a specially made chock stack. The theory is the same in either case. The chocks are placed in opposition in a parallel crack. A downward pull on the larger chock causes it to wedge between one side of the crack and one side of the opposing chock. All stacked chocks should be seated with a firm tug before use. If two independent chocks are used (fig. 10-13a), they should be connected with a carabiner so that if the placement fails, a chock will not be lost. A chock stack (fig. 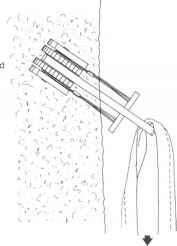 10-13b) is constructed by putting two passive wedging chocks on the same sling. The chocks are different sizes, with the smaller chock at the end so that either can be used in a non-stacking chock placement. Stacked wedges aren't used so much any more because climbers now have the option of spring-loaded wedges or spring-loaded cams, which work better and are easier to place. Although wedging chocks work best in vertical or near-vertical cracks, horizontal cracks sometimes can be used. The horizontal crack should constrict at the lip of the crack. The chock can be slotted in a wider section and then slid behind the constriction (fig. 10-14). A well-placed wedging chock in a horizontal crack can be very secure because it tends to be multidirectional. Fig. ¡0-14. Passive wedge slotted behind a constriction in a horizontal crack crack is more likely to fail. The edge of the chock can cause the sling to shear, and the chock itself will create a camming action at the lip of the crack that could cause it to crumble (fig. 10-15). Fig. 10-15. Passive wedge placed in a horizontal crack, side view: a, correct, slotted deep within the crack; b, incorrect, slotted at the lip of the crack. A wedge that's trapezoidal in shape from a top view may work well in a crack that flares outward. Used with the narrow sides of the chock against the rock, this shape can provide a stronger and more stable placement in this particular situation because it increases surface contact with the rock (fig. 10-16a). 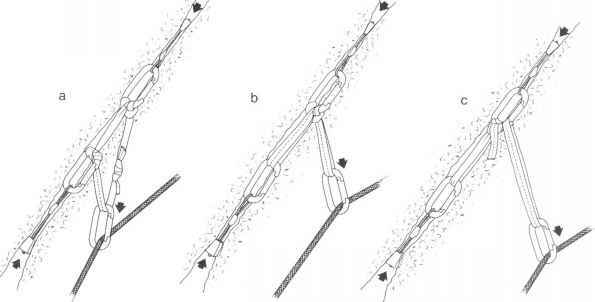 A crack that flares inward can cause a seemingly strong placement to be insecure (fig. 10-16b). If you keep alert you should be able to see this situation before making a bad placement. Fig. 10-16. 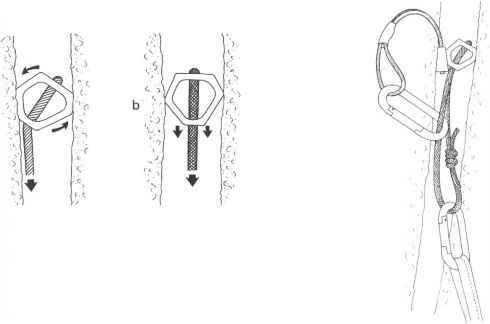 Using passive wedges in flaring cracks: a, a secure placement in an outwardly flaring crack; b, an insecure placement in an inwardly flaring crack. Passive wedging chocks don't work well in pockets. 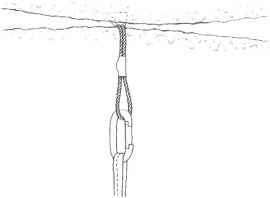 For a threaded placement, where a crack constricts to form a tunnel, a wedging chock can sometimes be threaded through to form a protection point (fig. 10-17). The chock can be threaded upward or downward. A wired chock will thread more easily than a chock that has accessory cord for a sling. 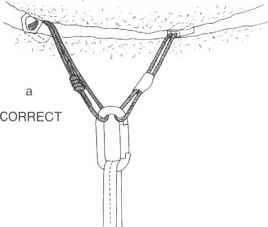 Be sure the crack does not widen too much behind the constriction, possibly permitting the chock to pull through. Good threaded placements, however, can be very secure because they are often multidirectional. Climbers also have a batch of popular names and brand names to use in referring to passive camming chocks: hexes, hex nuts, Hexentrics, Tri Cams. A passive camming chock is placed in a crack in such a way that when it takes a load—from, for example, a 160-pound climber at the end of a 30-foot leader fall—it tries to rotate. The rotation causes the chock to cam and lock in place. The shapes of camming chocks vary. One manufacturer will use a design completely different from that of another, and designs continue to evolve. Traditional camming chocks had a balanced hexagonal shape. Both pairs of opposing sides used for camming were the same distance apart. These hex nuts could cam and lock in place, but had limited versatility because each nut could fit only a small range of crack sizes. Chouinard Equipment (now Black Diamond Equipment) modified the basic hex nut in creating its Hexentric nut, in which each pair of opposing sides is a different distance apart. The Hexentric can be used in a greater range of crack sizes because it can be placed for narrow camming or wide camming and provides different camming angles (fig. 10-18). It can also be used endwise as a passive wedge. Fig. ¡0-18. Camming modes of a Hexentric chock: a, narrow camming; b, wide camming. The Lowe Tri Cam is another design, using a completely different shape to generate the camming action. Because of its shape, the Tri Cam can be used in a range of crack sizes (fig. 10-19). Fig. 10-19. Camming modes of a Lowe Tri Cam chock: a, major cam mode; b, minor cam and wedging mode. specific range of crack sizes. If a crack is too wide, the chock can fall out. An excessively tight fit, on the other hand, can prevent the camming action from occurring. Then the camming chock would simply act like a passive wedging chock. After you've placed a passive camming chock, give a sharp tug on the sling. This will initiate some camming action and seat the chock in place. Passive camming chocks work well in vertical cracks that are parallel or that do not expand too much. Place a chock that is tight enough to have maximum contact with the rock, but that has enough room for proper camming action to take place under load. If the chock is too small, only its edges may be in contact with the rock and, under load, these edges can shear off. A loose chock also can be dislodged by rope movement. The fit should be snug, which will help hold the chock in place when it's not under load (fig. 10-20). One trick that can create a stable placement is to build a combination stack using a passive wedging chock with a passive camming chock—a Stopper with a Hexentric (fig. 10-21). Fig. 10-20. Placement of a Hexentric in a vertical crack: a, correct, Hexentric in proper camming mode with sides fully contacting the rock; b, incorrect, Hexentric is too small for the vertical crack. No camming will occur. Fig. 10-22. 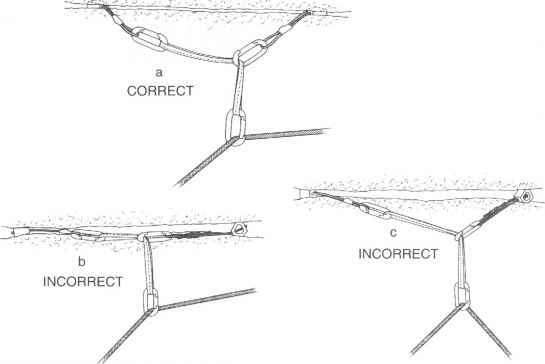 Placement of a Hexentric in a horizontal crack: a, correct, chock sling exits near roof of crack, proper camming will occur; b, incorrect, chock sling exits near bottom of crack, little or no camming will occur; c, caution, if the Hexentric moves back in the inwardly flaring crack, proper camming will not occur. Passive camming chocks also like parallel cracks that are horizontal. Place the chock so the sling leaves the crack closer to the roof than to the floor of the crack (fig. 10-22a). Otherwise, it won't cam (fig. 10-22b). Be careful that the chock isn't rotated out of position by sideways forces. The crack shouldn't widen inward too much or proper camming action won't take place (fig. 10-22c). Passive camming chocks don't work well in flaring cracks, where they tend to be unstable and don't make maximum surface contact. Tri Cams work in some flaring cracks. However, all points must still be able to contact the rock and that may not be possible. If the pocket is deep enough, a Tri Cam will work, but it must be recessed completely into a pocket for maximum surface contact and stability (fig. 10-23). Rope movement can easily dislodge this placement. Like passive wedging chocks, some passive camming chocks can be threaded through a small rock tunnel to create a protection point. In this case, the chock is relying on wedging and not camming action to hold a load. 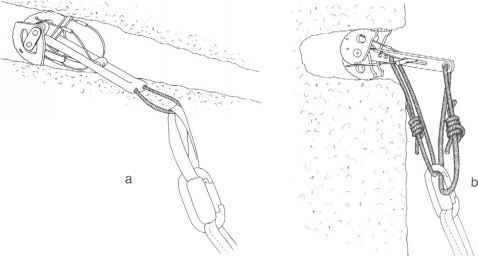 This is another of those technical terms you won't usually hear while moving up a rock face: spring-loaded wedging devices (fig. 10-24). That's what they're called here, because it's a good technical description. In action, you'll hear them referred to under such names as Quickies, Rock 'n Rollers, and Ball Nuts. Fig. 10-24. Examples of spring-loaded wedging devices: a, D. Best Quickie, contracted and expanded; b, Go-Pro Rock ' n Roller, contracted and expanded; c, Lowe Ball Nut, contracted and expanded. cracks. A spring-loaded wedging device features two sliding pieces in opposition. 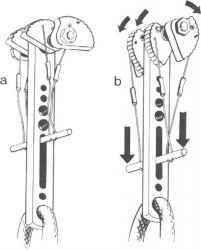 A trigger mechanism held by a spring controls the position of the smaller sliding piece. Pull the trigger, and the smaller piece slides lower against the larger piece—narrowing the profile of the device so it can fit into the thin crack. Release the trigger, and the smaller piece springs back higher against the larger piece—expanding the profile and wedging the pieces against each other and against the walls of the crack. The force of a fall wedges the pieces even tighter. You can place a spring-loaded wedge in a vertical crack using only one hand, a big improvement in efficiency over passive chock stacks. After placing a spring-loaded wedge, give it a tug to seat it securely. Spring-loaded wedges also can be used in horizontal cracks. Try to place them so the stem of the device won't be bent sharply around a rock edge in case of a fall. The stems are flexible, but may not be designed to hold a fall if they are bent too much. Some spring-loaded wedges are designed to be separated and used as individual wedges if you wish. This makes the device more versatile, but be sure that's what the manufacturer had in mind before you try it. even or flaring cracks and reduccs the possibility it will be dislodged by rope movement. Spring-loaded wedges don't work in pockets and threaded placements. First came Friends. The original spring-loaded camming device was developed in the mid-1970s and dramatically expanded the limits of free climbing by providing protection that could be placed with one hand and that could adapt to a variety of cracks. Climbers now could take on tough routes that would be very difficult to protect with conventional chocks. Since the development of Friends, variations on the basic design have been created. Newer designs tend to use cable stems, more flexible than the solid stems of the original Friends. Some include three cams instead of the four used in each Friend. Among today's most popular spring-loaded camming devices (fig. 10-25) are Friends and Flexible Friends (manufactured by Wild Country), Cam-alots (made by Black Diamond Equipment), and TCUs (Three-Cam Units, by Metolius). The three or four cams in a spring-loaded camming device are connected to a trigger mechanism. Fig. 10-25. Examples of spring-loaded camming devices: a, Wild Country Friend, expanded and b, contracted; c, Wild Country Flexible Friend; d, Black Diamond Camalot; e, Metolius TCU (tri-cam unit). Pull the trigger and the cams retract—narrowing the profile of the device so it can fit into a particular crack. Release the trigger and the cams again rotate outward—expanding the profile until the cams grip the sides of the crack (fig. 10-25a). In a fall, the cams try to rotate and expand again, gripping the crack even more securely. The three or four cams rotate independently of each other, permitting each to expand to the maximum, wherever it may sit in a particular crack. All is well if you've placed a spring-loaded camming device and all the cams, expanded to their midpoint, are in contact with the rock and the stem of the device is pointing in the likely direction of pull (fig. 10-26a). 1. All the cams don't touch the rock. The placement will be unstable. Find a better spot. 2. The cams are over-retracted in the crack (fig. 10-26b). The device may be jammed in so tightly that it can't cam, and it may be very hard to get the thing out. Use a smaller spring-loaded cam. 4. The stem does not point in the likely direction of pull (fig. 10-26d). A fall can force the device to rotate, perhaps causing the cams to lose their grip. In an uneven crack, the independent cams can expand to different widths. This is good. It means the device will adjust to variations in the crack. But if the cams are too unbalanced, proper camming action won't occur and the placement could fail. This is bad. So always try to make sure that each pair of cams is symmetrically oriented and that all cams contact the rock. Fig. 10-26. Correct and incorrect placement of spring-loaded camming devices: a, correct, cams expanded to midpoint, stem in likely direction of pull; b, incorrect, cams are over-retracted, proper camming may not occur; c, incorrect, cams are over-expanded, no camming will occur; d, incorrect, stem is not pointed in likely direction of pull. only three cams, instead of four, are smaller and narrower. They're designed for shallower placements, though they can also be used more conventionally. The four-cam devices have a bad habit of "walking" into cracks as a result of rope movement, making them sometimes difficult to retrieve. The three-cam units will rotate more and are less likely to walk. Spring-loaded camming devices really come into their own in parallel-sided vertical cracks. They're easier, faster, and safer than stacked wedges or passive cams. When correctly placed, the stem of the device will point in the anticipated direction of pull, allowing the load to be transmitted along the axis of the stem and maximizing strength of the placement. You can also use spring-loaded cams in horizontal and diagonal cracks, but watch out for stem breakage. The original Friends design uses a solid stem. This is fine as long as the direction of pull is along the axis of the stem, which is usually the case in a vertical crack. The picture changes with horizontal cracks. Newer designs from the makers of Friends and from other manufacturers use flexible cable stems, which can bend and adjust if the direction of pull is not along the axis (fig. 10-27a). However, the original Friends are still being made and are in wide use, so it's important to know how to minimize the danger of having a solid stem break in a horizontal placement. If the solid stem doesn't extend beyond the edge of the horizontal crack, the stem won't come under any dangerous forces. However, if the crack is shallow and the stem extends beyond the edge of the crack, the stem would be forced against an edge during a fall and could shear at the lip of the crack. You can reduce the danger of breakage by adding a tie-off loop, of accessory cord or webbing, to the largest hole in the stem. Make it slightly shorter than the regular chock sling. Clip into the tie-off loop so the force of any load will be taken closer to the cams (and farther from the end of the stem). As a backup, also clip in the regular sling in case the tie-off loop fails (fig. 10-27b). Fig. 10-27. 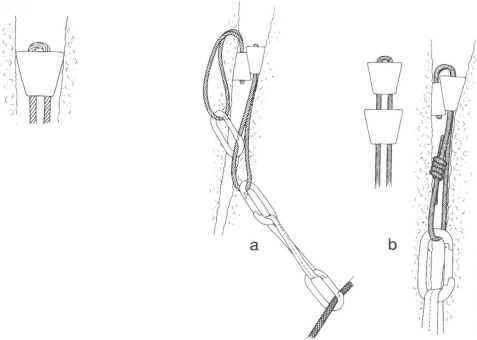 Spring-loaded camming device placement in a horizontal crack: a, flexible cable stem can bend and adjust to the direction of pull; b, a tie-off loop can reduce the danger of solid-stem breakage. Because each cam works independently, they can individually expand to fit a flaring crack. Problems occur if the crack flares too much. Some of the cams could over-expand, making for an unstable placement. The device may then be more susceptible to rotation or rope movement and less able to cam properly under load. Spring-loaded camming devices don't work for threaded placements. They are usable in some pockets, but only if the pocket is deep enough to allow all cams to touch the rock. It's difficult to place protection in wide cracks because most chocks aren't big enough. Sometimes the answer is a large spring-loaded camming device, but these can get awfully heavy. An alternative spring-loaded device for protecting wide cracks is the telescoping tube chock. Fig. 10-28. Spring-loaded tube chock: a, Mountain Hardwear Big Bro, contracted and expanded; b, Big Bro correctly placed in a vertical crack. far enough for the tube to bridge the crack (fig. IO-28a). A locking collar keeps the tube extended. After setting the chock, the climber clips in to a sling attached to one end. With a load on that end resulting in an upward force on the other end, the device acts like a passive camming chock (fig. 10-28b). Under load, a chock creates expansion forces. The relative amount of expansion force created by a chock—whether it's a wedge or a cam—is known as the wedging factor. Splitting firewood with a wedge is an illustration of wedging action. A chock is a wedge in the rock. Put a load on the chock, and it tries to expand the rock—just as hitting a wedge with a hammer causes it to split firewood. The relative amount of expansion force depends on the angle of a chock face (fig. l()-29a). If the taper angle is smaller, the wedging factor will be higher and it will put more force on the rock (fig. l0-29b). Conversely, if the taper angle is larger, the wedging factor will be lower (fig. 10-29c). Friction between the rock and the chock affects the wedging factor. Rougher rock increases friction, which decreases the wedging factor. Dirt or vegetation can lubricate the chock, reducing friction and increasing the wedging factor. The applied load and the wedging factor combine to determine the actual amount of expansion force generated. A high applied load, such as a falling climber, taken on a chock with a high wedging factor results in a very large expansion force. Fig. 10-29. The wedging factor: a, illustration of taper angle and expansion forces; b, narrow chocks have small taper angles and generate greater expansion force under load; c, wide chocks have large taper angles and generate less expansion force under load. pound climber who puts full weight on the chock now generates 2,040 pounds of expansion force. The wedging factor becomes particularly important when placing a chock behind a flake. Expansion force could push the flake outward, loosening the protection. It could even knock the flake off, destroying the protection point. Chocks with higher wedging factors are more likely to generate this magnitude of expansion force. A flake best resists expansion force near its point of attachment. Consequently, it may be better to use a smaller chock (with greater wedging factor) near the attachment point, than a larger chock (with lower wedging factor) higher up. The tradeoff in using a smaller chock is that it is a weaker piece of protection. The camming action of a spring-loaded camming device generates very concentrated expansion force. Be cautious in using them behind flakes. Bolts and pitons are protection devices that are drilled into the rock or pounded into cracks. They sometimes provide protection where there's no place to lodge a chock. A bolt is a permanent piece of protection driven into a hole drilled in the rock (fig. 10-3()a). A bolt hanger provides attachment for a carabiner, and a threaded nut is sometimes needed to attach the hanger to the bolt. A piton is a metal spike that is pounded into a crack to provide a point of protection (fig. 10-30b). The blade of the piton is the part driven into the rock; the eye is the point of attachment for the carabiner. Placing pitons is called pitoncraft, a skill that will be studied in Chapter 11. Pitons and bolts are being introduced here because it's necessary to know how to deal with ones you will encounter on climbs, put in place by previous climbers. You need to know how to check these placements to determine if they can be trusted as protection for your climb. Fig. 10-30. 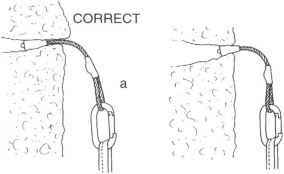 Bolts and pitons: a, bolt with a bolt hanger; b, piton driven into a vertical crack. Pitons arc seldom used in modern free climbing. 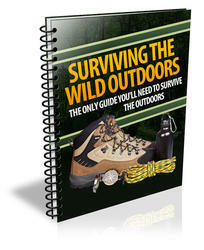 They still get some use on climbs in remote areas or on routes requiring mixed free and aid climbing. Bolts are now widely used to protect some of today's severe free rock climbs. The bolts create artificial protection where there are no rock features to accept either chocks or pitons. However, climbing ethics encourage the use of clean-climbing techniques when possible, to prevent the permanent scarring caused by pitons and bolts. Look at fixed bolts with a skeptical eye. How safe a particular bolt may be is going to depend on the quality of the hardware, the type of rock, the skill of the climber who placed the bolt, and so forth. It's to your advantage, to say the least, to carefully check out every bolt you encounter before clipping into it. Check to see that the bolt is placed in rock that is solid, not crumbling or deteriorating. Be sure the hanger is flush to the rock. 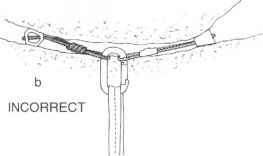 Look for corrosion or cracks on the bolt or hanger. Beware of aluminum hangers because they can become brittle with use. Steel hangers tend to be stronger. Do not tap on a bolt to test its strength or security as repeated hammering only loosens the bolt. The bolt can be partially tested by hand or by clipping a runner onto it and tugging. If it moves, or if for any reason the placement doesn't seem solid, forget it except possibly for backup protection. If you like the bolt, use a carabiner to clip a runner to the bolt hanger. In some climbing areas, bolt hangers are customarily removed by climbers after use, so it may be necessary to carry along a few hangers and nuts in 1 /4-inch and 3/8-inch sizes. Fig. J0-3]. Placing a wired chock on a hangerless bolt: a, create a loop by sliding the chock down the chock sling; b, slide the chock up the sling to form a noose around the hangerless bolt. aid climbing or in constructing opposing chock placements. A fixed piton that you run across during a climb may be a quick and easy way to get some good protection. It may also be old and in bad condition. Over the years, pitons rust, weaken, and become loose. Take a close look at the piton. Is the eye broken or badly rusted? Is the piton rusting in the crack or perhaps even loose enough to pull out by hand? Is the piton bent? Ideally, the fixed piton is perpendicular to the likely direction of pull, and it's driven in all the way, with the eye up close to the rock. Examine the condition of the rock, looking for deterioration. Test the piton first by hand. Then tap on it with a piton hammer or a large chock. If it moves, it's unreliable. Beware of older pitons that use iron rings as an attachment point because the rings tend to be very weak. If there is any doubt about a piton's strength or security, try to find other protection. If the piton seems to be strong, secure, and in good condition, use it. Attach a runner with a cara-biner clipped to the piton eye. 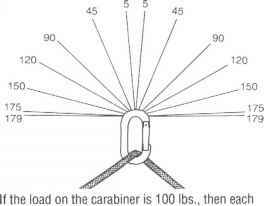 Be sure the cara-biner will not bind against the rock under load, which could cause carabiner failure. If a piton eye is bent so much that the carabiner won't fit through, it may be possible to thread a cabled chock through the eye. Don't count on it to hold a hard fall, however, and avoid this placement if you have an alternative. Two pieces of protection are sometimes linked in order to do a better job than a one-piece place ment. This technique is commonly used in two different ways: to set up opposing chocks so the placement gives multidirectional protection, or to equalize the load over two pieces of protection. Most chock placements will hold only a downward pull. They are one-directional, providing protection for a load from only a single direction. No problem, you might say. If I fall, I'll only fall downward. True. But there are times a chock must be able to hold an upward or sideways pull. 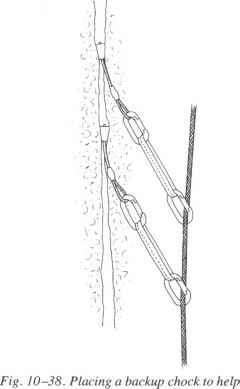 When the route changes direction at or above a placement, the resulting bend in the rope may simply pull a passive chock up and out of the crack. In some cases a fall taken on a higher chock will put upward and outward forces on lower chocks. What's needed in these situations is multidirectional protection—placements that will hold fast whether the pull is down, up, or out. The most obvious multidirectional protection is provided by trees, natural tunnels, pitons, and bolts. Otherwise, the standard method of providing multidirectional protection is to place a pair of opposed chocks—chocks that are linked so that they pull toward each other. This method also is used to hold passive wedging chocks in horizontal cracks that won't take a simple placement. An "iffy" chock in a vertical crack needs help from an opposed "keeper" chock. The basic procedure is simple. Place one chock in the crack so it can take a downward pull. Below that, place a chock that can take an upward pull. Clip a carabiner to each chock sling. Using a clove hitch or half hitches, tie the two carabiners together with a runner so there is tension between the two chocks, which helps hold them in place (especially the bottom chock—the keeper—which otherwise might drop out). Then clip the rope into this arrangement. Three methods are shown here in figure 10-33. Fig. 10-33. Three methods for creating vertical opposition: a, using one runner, chocks are held by tension on one side of the runner using clove hitches; b, using one long runner, a clove hitch or two half hitches holds the tension between the chocks; c, using two short runners, one runner creates the tension between the chocks using a clove hitch or two half hitches, the other runner clips to the rope. texts, should be avoided (fig. 10-34). This setup has two principal disadvantages compared with the preferred methods. First of all, it places a dangerous multiplication of forces on the upper chock. Because the runner is not tied off to the upper chock, the runner moves freely through the carabiner, which acts like a pulley. This will double the usual force on the upper chock, perhaps causing it to fail. Secondly, the bottom chock has nothing to hold it in place. This chock may stay put if it's set securely or if there is some tension on the rope. Otherwise, it could simply drop out. The preferred methods (illustrated in figure 10-33) avoid the dangers of load multiplication. Each preferred method creates tension between the chocks to hold them in place and includes a tie-off at the upper chock to prevent the carabiner from acting like a pulley and multiplying the load. Fig. 10-35. Creating horizontal opposition in a crack: a, correct, chocks are slotted back into the crack and angled to resist rotation and outward pull under load; b, incorrect, chocks are slotted at the lip of the crack and face directly at each other; c, incorrectly placed chocks in vertical opposition can be rotated out of the crack under load. If a horizontal crack doesn't have a nice constriction to slot a passive wedging chock behind, you can try to set up opposing chocks. Under load, the opposition pulls the chocks toward each other, creating tension that keeps them in the crack. Here's the basic procedure: slot two chocks back in the crack. They should face in the general direction of each other, yet be set at enough of an angle to withstand some outward and downward loading. If at least one chock cannot withstand some downward loading, the horizontal opposition is likely to fail. There are a couple of ways to link the chocks to each other and to the rope. 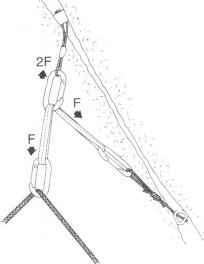 In one method, a runner clipped to the carabiner at one chock sling simply runs through the carabiner at the other sling and then is clipped to the rope (fig. 10-35a). Be sure the chocks are slotted back into the crack and are partially angled outward. If not, the chocks could rotate out of the crack and fail under load (fig. 10-35b and c). Also, be aware that the usual force felt by the right-hand chock in figure 10-35a will be increased because its carabiner will act like a pulley. Choose a strong chock for this placement. Fig. 10-36. Clipping two chocks together to create horizontal opposition: a, correct, chocks are slotted hack into the crack and angled to resist rotation and outward pull under load; b, incorrect, chocks are slotted at the lip of the crack and face directly at each other. The chocks are susceptible to rotation and outward pull under load. Another method is to clip the two chocks together with a carabiner (fig. 10-36). The carabiner can either be clipped into both chock slings or into runners that extend from the slings. First, slot the chocks back in the crack, facing in the general direction of each other but angled partially outward. At least one must be able to withstand outward and downward loading. Fig. 10-37. How the angle between protection affects the force exerted on the protection under load angle and the protection could fail. The angle should be kept below 90 degrees, and ideally around 45. Using runners to extend out from the slings will reduce the angle, helping minimize the force felt by the chocks during a fall. Faced with a hard move and questionable protection, a leader may decide to place two pieces of protection close together. If the upper chock fails, the lower chock is there as a backup (fig. 10-38). Fig. ¡0-39. Constructing the two-point equalizing protection: a, correct, the carabineris clipped from one loop of the twisted runner to the other; b, incorrect, the carabiner is clipped across the twisted runner. with one hand and requires the use of only one runner. Twist the runner into two halves, then clip each end into a protection point. Clip a carabiner between the two halves, providing an attachment point for the rope (fig. 10-39a). A load on the rope causes this carabiner to slide between the questionable protection points, adjusting the runner to equalize the force exerted on each point. Important: clip the carabiner from one loop of the twisted runner to the other loop, not crosswise (fig. 10-39b). You'll find out why if you fall and one of the protection points fails. If you've done it right, the carabiner will stay connected to the runner, which stays connected to the remaining protection. Do it wrong, and the carabiner, with you attached, will plummet.